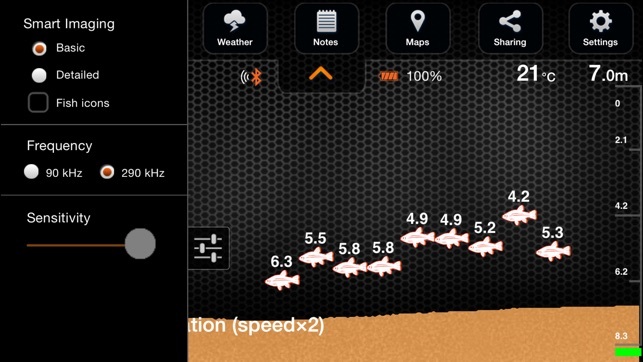 With the most downloads of any fishfinder app, Deeper is the best app for smart anglers. It works with or without a Deeper sonar and boasts great features for planning fishing trips and maximising your catch rate. Know when to fish, know where to fish, then measure depth, find your targets, reel them in, log your catches and share on social media. All in one app. Plan your next angling trip with the solunar calendar and weather forecasts. Log every catch. Use the notes function to keep a detailed record of your best catches. Map your trip. Download maps (which you can then use offline), then mark your favourite spots. Share your catches with fellow anglers using the app’s in-built camera mode. Just snap that trophy catch and share on social media. Discover Deeper. 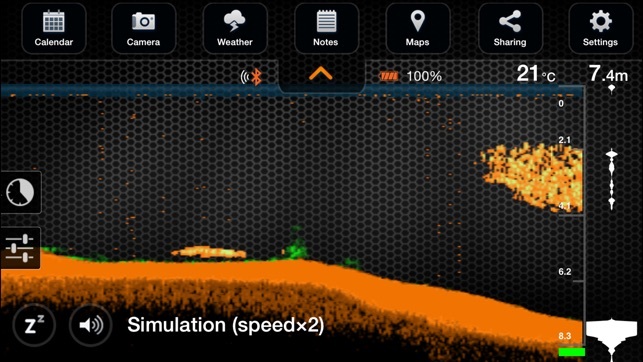 See how a fishfinder can revolutionise your fishing by running the sonar simulations. 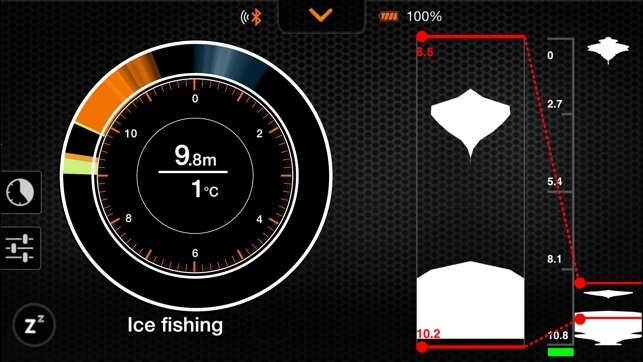 Then take your smart angling to the next level by using the Deeper app together with a Deeper smart sonar (explore our product range at www.deepersonar.com). Combined with one of these fishfinders, the Deeper app turns your smartphone into a high-grade sonar display. 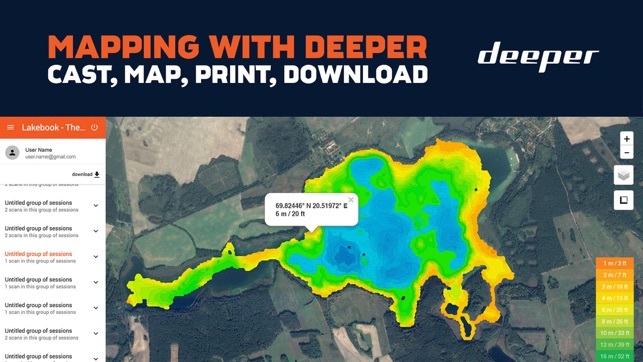 Get data to enhance your angling - depth, temperature, bottom structure, vegetation, fish location and more, all displayed live on your smartphone screen. Take control of your sonar readings with fully adjustable sensitivity, adjustable fish and depth alarms, a range of display options and a choice of narrow or wide beam scanner. Choose different modes for different types of angling. Use it as a fishfinder and sonar from the shore, as an ice flasher in ice fishing mode, or map out the waters you fish in boat mode. Create bathymetric lake maps direct from the shore in onshore fishing mode (only with the PRO+ model) or with a Deeper sonar mounted to your boat or kayak (works with all models). View and analyse your lake maps on your home computer using Lakebook – the Deeper Data Manager. Login at maps.deepersonar.com to see your maps and download raw mapping data. Map and mark every ice fishing hole and store data from your Deeper sonar for every location in Ice Fishing mode. 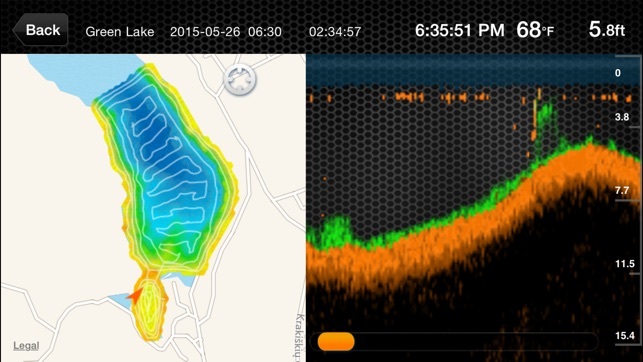 Store all your angling data collected from your Deeper smart sonar with unlimited data storage in the app. * Solunar fishing activity calendar - view month / week / day / hour. * Weather forecast - temp; wind; humidity; pressure; sunset / sunrise; moonset / moonrise. 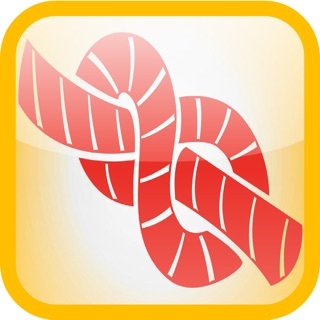 * Fishing log - record GPS coordinates, time, and weather; add descriptions. * Offline maps - download and use offline; mark and save your favourite spots. * Camera mode with social media sharing – Facebook, Twitter, Google+. * Live sonar data – depth, temperature, bottom structure, vegetation, fish location. * Fully adjustable display – enable or disable depth alarms, fish alarms, fish depth display and fish icons; adjust brightness; choose classic, day, or night colour mode; change units (metric, imperial, fathoms). * Manage sonar settings – adjust scanner sensitivity; choose frequency and scanner scope (290 kHz / °15 or 90 kHz / °55); use sleep icon to pause readings and preserve battery. * NEW FEATURE: Lakebook – the Deeper Data Manager at maps.deepersonar.com. View and analyse all your lake maps, download raw data. * Store data: unlimited data storage. * Choose fishing mode: standard (shore angling), boat, ice fishing, onshore mapping, night fishing. * GPS Ice Hole Marking – Map and mark every ice fishing hole. Save data for each location (works for all models). * Bathymetric maps – Create bathymetric (depth contour) maps. By boat (use boat mode, works for all models), from the shore (use onshore mapping mode, works only with PRO+). I love the thought of this product, it’s compact and compatible. Except the Deeper didn’t work out of the box like it said it would. 1’-130’ is what Deeper says it can function for range right on the side of the box. I can not get 10’ from my iPhone or IPad without it losing connection, no matter if I run the radar in basic or detail mode. Tried for a few weeks contacting them to find out what was wrong. No help, made me sound like I didn’t have a problem. So if you want to cast with your Deeper, I would recommend strapping your phone to the end of your line as well. Last summer I was using this basically over priced tennis ball on my kayak which I’ve made a special mount for. P.S. “DO NOT USE their flexible arm mount they offer for this product, the clamp is cheap and can fail and I’ve witnessed it. The Deeper floats, but not with the flex arm attached to it.” With the Deeper sitting basically next to me it works. NOW the app crashes every time I try to open it, yes I’ve updated it and I run the newest IOS on a iPhone 8 Plus. Last week I spent 20 mins just trying to sync up the Deeper to my iPhone ice fishing and I’ve stayed quiet long enough. So thank you Deeper for everything. Maybe I’ll attach the flex arm to my Deeper and watch it sink and in 50 years if the find it, they can figure out what you couldn’t. So sorry to hear that you had issues like that! The kind of connection range that you're getting doesn't look normal at all, and could be something related to the hardware of your Deeper. We would really like to get this resolved, so could you email us at support@deeper.eu please? We'll help you. Thanks. Deeper pro + with newest update is amazing on iphone! I have an iphone 7 with ios 12 and the app runs great ...for people having issues with loosing connection turn off cell data and use just wifi most new phones are set up to auto switch to cell data when internet is lost on wifi i have landed some awesome fish from my little trolling boat i bring a usb battery charger to recharge on long days of fishing took about 2 hours to recharge and as far as people having issues with white map download the offline map for your state in settings ..absolute fan and supporter of deeperpro+ keep up the good work and updates and ill be a supporter for life! I love using my Pro+. I’ve figured out how to keep it stationary is moving waters as well. I’ve used it in salt and fresh water, and matched it up against my Hummingbird finders, it’s accurate alright. I would like to see more development to the App, something akin to a side scan. I think that would be an awesome step forward. The reason I suggest this is simply because, if you’re in 40 feet of water in wide band, you really have no way of telling which direction the fish are within your sonar cone. That makes presenting a bait very difficult. Otherwise is a great product and I throughly enjoy mine!